Buttermere is one of the smaller major lakes of the English Lake District. Its significance lies not in size but in beauty and history. The lake is only a little over a mile long, and about a third of a mile long. Thousands of years ago, following the last ice age which shaped the vallley, it was a single lake with Crummock Water. The half mile of low land now separating the two built up over the centuries by silting with debris from the mountain streams. Approached from the north along the eastern shore of Crummock Water there is no hint of the hidden valley and the other lake lying beyond the mass of the hillside as it projects into the water at Hause Point, obscuring everything behind it. Although today the rock has been blasted way to allow the road to run not far from the water's edge and give easy acces to what lies beyond, almost a thousand years ago it was a different story. This hidden Lake District valley was the base from which the Norse settler inhabitants resisted brutal invasion by the Norman French armies in the century following the 1066 battle of Hastings. The story is well told by Nicholas Size in his book, The Secret Valley. The resistance was so effective that little or no information about Cumberland and Westmorland is to be found in Domesday Book. Despite many attempts the Normans never conquered this land of lakes and mountains, and the bones of many an unsuccessful attacking army are now merged into the valley soils. 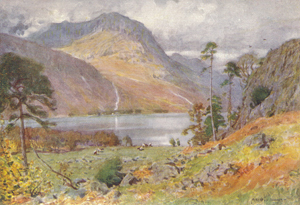 Buttermere was "in the news" in the early 19th century due to a sensational story of bigamy and fraud. Mary Robinson, daughter of the landlord at the Fish Inn, was tricked into marriage by a man claiming to be a Member of Parliament and from a wealthy aristocratic family. He ended up being hanged at Carlisle for fraud. She seems to have survived the incident quite well and as "The Beauty of Buttermere" was a star attraction for visitors to the area for some years following. The Lake Poets picked up the story. Wordsworth features Mary in his poetry, and almost two hundred years later she still attracts attention (e.g. Melvyn Bragg's novel, The Maid of Buttermere, 1987). This area has for centuries been a source of the slate that covers the roofs of thousands of houses around the region and further afield. If such activity were to be commenced now it would immediately be condemned as despoliation of the countryside. Because the quarry workings are old they are seen almost as an attraction, to be explored and written about by industrial archeologists, amateur and professional alike. I have never been able to understand this kind of inconsistency in the treatment of industrial development: if it's old it's good, bringing back memories of how our forebears struggled to survive in an inhospitable environment; if it's new it's bad, yet another example of commercial interests marring our natural heritage. Somewhere there has to be a sensible balance between preservation and progress. There is good fishing at Buttermere, from both bank and boat - subject to National Trust permit. The trout are said to be modest in size but lively.